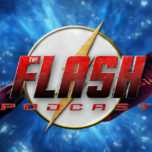 On this week’s episode of The Flash Podcast, Andy Behbakht, Amy Marie, Brittany Rivera and Andrew Dyce get together to review episode 23 of The Flash Season 4 titled “We Are The Flash,” which is the Season 4 Finale! After a long season, it comes down to one epic showdown between the Fastest Man Alive and the Fastest Mind Alive while new mysteries are revealed of what’s next. In addition to that, they also read feedback from listeners about what they thought of the season finale. In the news session, the gang share their thoughts on the exciting crossover news featuring Batwoman while also sharing some personal news to the listeners. That and more on the Season 4 finale of The Flash Podcast! In case you missed it: as previously announced on the podcast, DC TV Podcasts has launched its own TeePublic store featuring amazing gear-up with your favorite DC TV heroes. Check out the store here which helps support the whole network! Be sure to keep your eyes and ears open for the upcoming DC TV Podcasts marathon charity in late June as well as the summer season of the podcast! Make sure you are following the amazing platform Shethority on Twitter and Instagram, created by the Arrowverse’s many talented super-women!